Amazon offers the PORTER-CABLE C2002 Oil-Free UMC Pancake Compressor for $99 + Free Shipping. Retail was $319. PORTER-CABLE Pancake Compressor is constructed with a pancake style tank for optimal stability, water drain valve, rubber feet and a 150 PSI. The higher pressure design provides longer air tool performance and features a 2.6 SCFM at 90 PSI allowing for a quick recovery time. Includes an oil free pump for no maintenance, low AMP 120V motor easily starting in cold weather or with extension cord, upgraded shroud with hand and console cover protecting vital components. Made for easy transporting and contains cord wrap with a 6 gallon capacity. 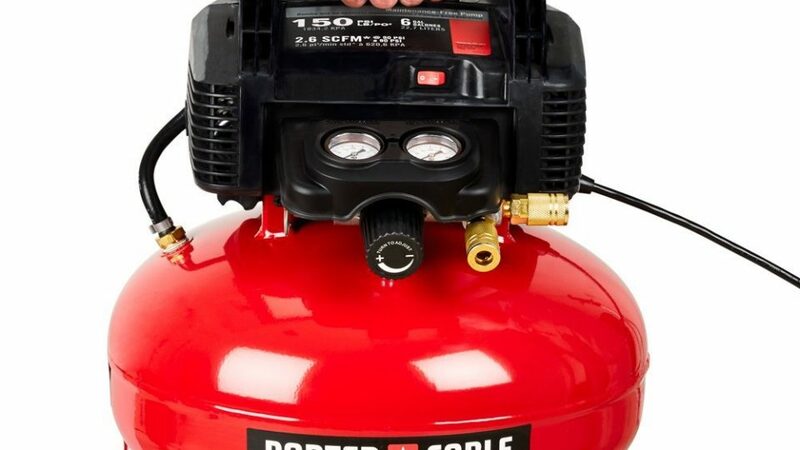 Product includes a one year limited warranty on compressor components.